It wasn’t a rainy night in Georgia, but a snowy day in the Peach State that got Evans thinking about a better way to warm the human body. 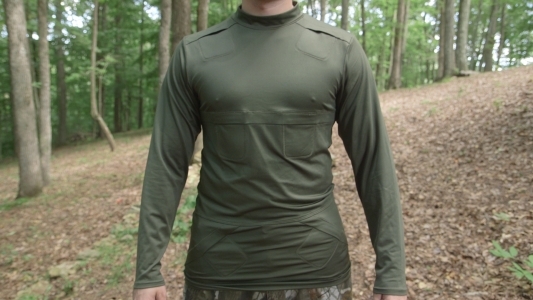 Now, more than four years and several twists and turns and multiple dead ends later, Evans is ready to launch PODZ GEAR™, a base layer garment that uses the circulatory system to distribute heat throughout the body. Evans, who graduated from EKU in 2012 with a bachelor’s degree in Industrial Safety and Risk Management, was a client of the University’s Business and Technology Accelerator and continues his relationship with Eastern as a client of its Innovation and Commercialization Center (ICC). A Kickstarter campaign is under way to raise funds and awareness. Evans, who still maintains a full-time job in Flatwoods, is joined by three-other co-owners: Jeremy Brown, Kenny Ledford and Anthony Vicars. “We’ve designed pockets to hold PODZ™ heat packs,” Evans said. “These pockets are arranged along major blood vessels. This allows the user’s circulatory system to utilize the blood as a heat transfer fluid. Using the blood to modify body temperature permits the user to maintain his or her body temperature. "Ulinke other base layers on the market, PODZ™gives you the option to use it as a normal thermal base layer or to insert heating packs to reheat the body. Nothing is guaranteed to succeed, but we believe from our vast research and testing that this product has a high chance to succeed in the market." To help support and back PODZ GEAR™, visit http://kck.st/18mQjy4. PODZ™ would be suited for a wide range of users: sports participants and fans, military personnel, outdoors enthusiasts, farmers, first responders, mail carriers, and others, Evans said. Evans said the Kickstarter campaign is $30,000, with the funding used to complete all the rewards, enhance marketing efforts, and cover legal costs. Evans said he gained leadership skills through his participation in a wide variety of student organizations, including Campus Outreach, Sigma Alpha Epsilon, Co-Op Advisory Board, Co-Op Student Ambassador Board, and the American Society of Safety Engineers, among others. Enter Kristel Smith, executive director of the ICC at EKU, and the business accelerator housed in the Center for Economic Development, Entrepreneurship and Technology in EKU’s College of Business & Technology. “Being an Accelerator client, I received lots of guidance on how to structure the company, ways to learn who our customers were, marketing, and so much more,” Evans said, adding that he receives much of the same kind of direction now as an ICC client. “I want to thank Kristel and everyone else who has helped with PODZ GEAR™. For more information about the EKU Business and Technology Accelerator and the Eastern Region Innovation and Commercialization Center, visit bizaccelerator.eku.edu and easternicc.eku.edu, respectively.